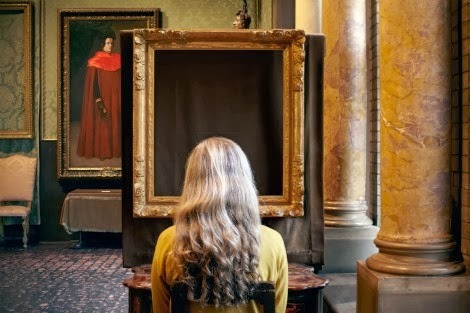 first of all, "last seen," the sophie calle exhibit, consisting of quotes taken over the years from gardner visitors, staff, and art thief investigators, about the gardner's storied stolen paintings. these quotes, juxtaposed over relevant images, can be hilarious, poignant and/or fantastically dumb. one visitor, we discover, has hated vermeer from the get-go as a kid, and is overjoyed someone has at last removed that damned vermeer from the museum. one investigator into the theft has recurrent nightmares about a stolen painting: it's shrouded, when he dreams of it, abu graib style, and has its head beaten in. 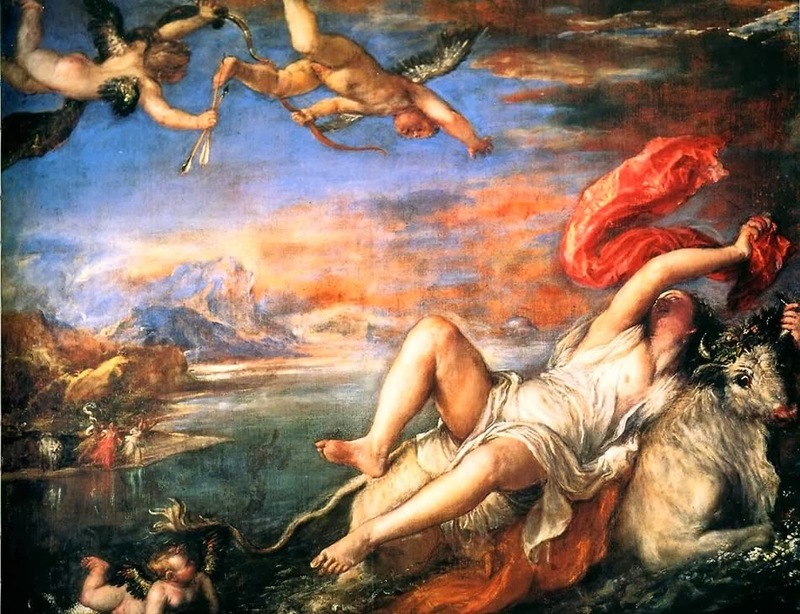 naturally, it's a pleasure to see the paintings that weren't stolen, the titian "europa" prime among them, of course. my art friend and mentor meri, an interesting artist in her own right, and i, stood below that great painting delving into it at length. it's worth all that delving: it's the story, in brief, of zeus, in white bull mode, carrying off the sensual girl from asia into europe in order, this being zeus, to do nasty things to her but also to found civilization as we know it. but why did gardner position "europa" so you can barely see the detail, or titian's famed brushstrokes? why position it so far above your head? why make it so dim? maybe, we were not supposed to scrutinize it, only crane our necks and marvel? the original writ of display as set down by isabella gardner is immutable. that immutablilty even extends to the cafeteria, not that were was such a space in the original gardner/berenson renaissance venue. the new cafeteria is a function of renzo-piano's renovation/addition. even a world-acclaimed architect wants to eat, or so one presumes. meri & i could not hear each other, not with normal speech and barely seven by shouting. i mentioned this problem to our waiter. he was well aware it. everyone complains of it, he said, including renzo-piano himself, who, when he dines in the cafeteria, is frustrated by inaudibility. nothing can be done about it, the waiter said, due to the immutability of the original gardner bequest, as reinforced and complicated by renzo-piano's own strictures. i asked the waiter if he himself much cared about visual art. he said he didn't, really. he cared about opera, and burst into a rendition of a richard strauss song, which shut most everybody up and got massive applause. ** nobody talks, it's too loud. like what yogi berra said about some restaurant: nobody goes there, it's too crowded.